This is my second in my three-part series thinking about the future of evangelicalism, especially in light of our current struggles with who owns the label (more next time) and what it means. My last post (or posts) was about separating the broad cultural assumptions surrounding religion from religious practice. My argument is that if we focus on actual religious behavior instead of the dividing lines we throw up we can learn something important about the nature of Christ’s Church in this complex, diverse, postmodern world. 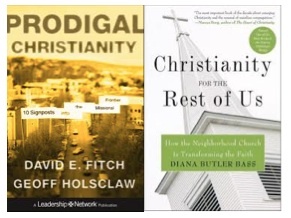 Last month I described why Prodigal Christianity by David Fitch and Geoff Holsclaw was so important to our thinking about a society that no longer fits our past cognitive structures. As they argued, we are now in some form of post-Christendom society. Not that Christianity isn’t relevant. To the contrary, it is more important than ever. But what changed is the notion that we can’t simply assume everyone shares our values or language. This is why the cultural baggage post had to happen first. We have to figure out how to talk about Christian faith in ways that will be heard within the contemporary culture. David and Geoff unpack a number of ways in which the faith can communicate in what they call “the far country”. By following the metaphor of the Incarnation, they offer serious vistas on how the Gospel comes to cultures that are not initially accepting. As their subtitle states, they offer “10 signposts into the missional frontier”: Post-Christendom, Missio Dei, Incarnation, Witness, Scripture, Gospel, Church, Prodigal Relationships, Prodigal Justice, and Prodigal Openness. I’ve recently finished Diana Butler Bass’ Christianity for the Rest of Us. I’m actually two books behind on her scholarship and her more recent work is focused on the nature of spirituality in America. Frankly, I read this particular book because it was on the shelf in the SAU library. But I was thrilled to read it because it opened my eyes to certain assumptions I was making about the nature of the religious landscape. The book is the result of a three-year study, the Project on Congregations of Intentional Practice, funded by the Lilly Endowment. In the face of common statements about the accommodation of mainline congregations expressed in press, pulpits, and sociological scholarship, the project set out to examine “vital congregations”. These congregations were different. Not because they had adopted conservative evangelical style or rhetorical schemes. Not because the pastors preached in jeans and layered shirts or wore hipster glasses. Not because the music was contemporary with lyrics projected up on the screen. These were mainline congregations that embraced their mainline heritage and yet looked for authentic faith. They did it in ways that may differ quite a bit from the average megachurch and yet it had the same approach to being serious about Christianity. Over the year or so I’ve been writing about the changing nature of evangelicalism, I periodically get comments claiming that my position is no different from mainline accommodationism. They are consistent with authors who have decried mainline religion as empty, embracing humanistic values in a desire to be accepted by the larger society. I’ve been troubled by these comments because they seemed so unaware of what real people in real churches were trying to do. The arguments seemed based on stereotypes of some mainline ministers from forty years ago. I was thrilled when Diana’s first chapter offers a critique of an accommodationist congregation, one she knew as a girl. This, she said, was not the kind of congregation she was trying to understand. Instead, she examined ten congregations in depth (there were 50 involved in a survey instrument but the richest part of the book comes from these congregations). These churches were from Lutheran, Episcopalian, Methodist, Presbyterian, and United Church of Christ denominations. And still, the faith present in these congregations was a far cry from the “anything goes” critique so often tossed toward mainline religion. The individual chapters explore some common themes the contributed to the vital faith evident in these congregations. Shockingly, she also uses “10 signposts”: Hospitality, Discernment, Healing, Contemplation, Testimony, Diversity, Justice, Worship, Reflection, and Beauty. Two sets of “10 signposts” — both books deal with Hospitality, Scripture, Testimony, Justice, Diversity, Beauty, Healing, and Reflection. They may use slightly different words but their messages are the same. There is a vital faith present in Christianity that not defined by culture war arguments nor by blind accommodationism. It is characterized by authentic faith that is tolerant of multiple views and trusts in the Holy Spirit to assist understanding. One book written to the evangelical community on what it means to live as people of faith in the postmodern world. One book written to the mainline community on what it means to live as people of faith in the postmodern world. Both finding similar metaphors to describe the elements of that faithful life. It was a wonderful discovery for me. It speaks to the vibrancy of God’s work in our midst. But I shouldn’t have been surprised by this. I realize that I read a number of people who are clearly evangelicals and serve in Methodist or Presbyterian or Lutheran congregations. They certainly aren’t accommodating to the larger culture. I also see a number of millennial evangelicals finding meaning and satisfaction in more liturgical, more diverse, more complex settings of faith found in some mainline congregations. To see them as abandoning faith is unfair to both them and the churches that attract them. I have a friend in Portland who once wrote some wonderful stuff on “confluence”. His metaphor is based on what happens with the Willamette and the Columbia come together. It’s not just that they are flowing the same way. It’s that their waters intermingle and at some point you can no longer tell which water came from which source. The current, however, is still strong. This is where the future of evangelicalism will be found. It the midst of the stream, following God’s leading into that future he has been building all along. Excellent article. Of course, I am speaking as one trained at an evangelical bible college some years ago, graduated from a mainline seminary a decade ago, and now serving as co-pastor in another mainline church. Again, thanks for an insightful article. I know a number of evangelicals worshiping at mainline churches in my area. They seem like they’re growing in their faith! And I know I am, too.